An unfortunate truth in concrete construction is that concrete cracks. There is no magic technology that solves all forms of concrete cracking. When properly used, Spray-Lock Concrete Protection (SCP) products may help reduce the chances of some forms of cracking, but not all. 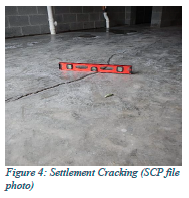 In this technical brief, you will learn how to distinguish between different types of common cracks and SCP’s products effects, if any, on those types of cracks. 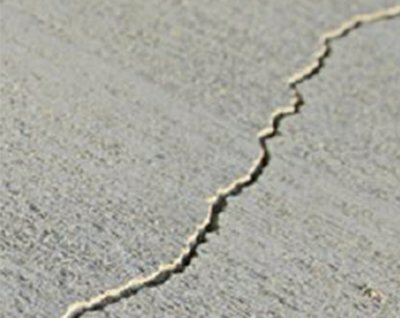 Cracking is caused by many different reasons, but all cracks in concrete are caused by movement of the concrete in a way that exceeds the concrete’s ability to resist the forces generated. Concrete is strong in compression, but relatively weak in tension, flexure, and torsion. Some cracking mechanisms cause the concrete to move differently from the top to the bottom, for instance, generating stress at the interface between the two movement planes. In general, concrete cracks due to external loading, thermal gradients, moisture gradients, or in response to a chemical reaction (internal or external). When loads exceed concrete’s ability to resist the forces applied cracks may occur. An example is negative-moment cracks above beams in an elevated deck caused by flexural forces between the beams moving in a downward direction. The concrete remains stationary above the beams while the concrete between the beams moves, sometimes resulting in cracking. Another example is cracking in a slab on grade that is exposed to traffic loads along an edge, breaking the concrete in a half-moon shape. SCP products do not help resist cracks due to external loading. Proper design to resist forces applied, including the strength of concrete and reinforcement sizing and positioning are the keys to limiting cracking due to external loading. Sometimes the surface of a freshly placed concrete slab dries out before the remainder, forming a “crust” that tends to crack. The cracks that form are typically shallow, run parallel to each other, and do not intersect the edges of the slab. The cracking typically appears in the time period just before finishing operations begin up to final troweling. These cracks are known as plastic shrinkage cracks because they happen when the concrete is still relatively plastic – it has not yet reached final set. 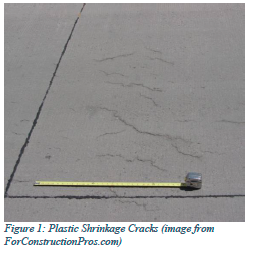 Plastic shrinkage cracks can occur when weather conditions cause rapid evaporation of bleed water before it can be replaced naturally by the subsurface concrete. Low relative humidity, high winds, and high concrete temperature can all contribute to plastic shrinkage cracking. The good news is that plastic shrinkage cracks are not usually structural problems. The bad news is that they are cosmetically unappealing in instances where the concrete is exposed. Weather conditions conducive to plastic shrinkage cracking of concrete can be readily predicted by using several weather-related websites and/or commercially available instruments. There are several recommendations that help prevent plastic shrinkage cracks from ACI, NRMCA, and other sources, including erecting wind breaks, misting or fogging the slab with water, placing concrete in the early morning hours, lowering concrete temperatures, and using micro fibers. SCP products have little to no effect on plastic shrinkage cracking since most plastic shrinkage cracks occur before it is the proper time for SCP product application. parameters that SCP technology affects. 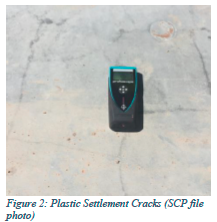 Plastic settlement can be of particular concern on deep (> 12”) reinforced concrete slabs. roweling, sprinkling water on the surface of the concrete during finishing operations, or finishing concrete while bleed water is still present.Because the shrinkage that occurs in the top surface differs from the substrate concrete, SCP products can do little to mask or alleviate that difference. 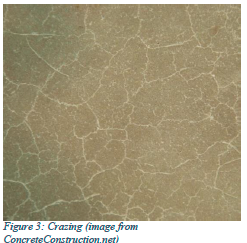 Although SCP technology can reduce drying shrinkage as a whole, crazing is caused by the differential between the top surface and the rest of the concrete. For instance, if the top surface of untreated concrete is expected to shrink 0.08% and the bottom of the concrete is expected to shrink 0.04%, SCP technology may reduce both values, but a difference will still occur, and therefore crazing may occur if the appropriate conditions exist. Settlement cracking is caused by the loss of base or subgrade support of the slab. Concrete is strong in compression, but relatively weak in tension or flexure. When support is lost, concrete may “settle” along with the base or subgrade material. These cracks often indicate a significant structural issue that should be addressed and are recognizable by the vertical displacement from one side of the crack to the other. Settlement cracking occurs due to loss of support beneath the slab. SCP products do not provide sufficient additional flexural strength to counteract this type of failure. Drying shrinkage cracks are caused by the change in volume of concrete associated with the loss of some of the water in the concrete due to evaporation. When concrete is first placed, it is typically at its greatest volume. Only a fraction of the water used in concrete is consumed by the cement hydration process. Much of the remaining water leaves the concrete, causing the concrete to shrink. When concrete is restrained by the ground, embeds, re-entrant corners, etc., tensile forces develop that can exceed the concrete’s ability to withstand them, and cracks form. Contraction joints are generally introduced to concrete to provide vertical planes of weakness that allow the concrete to form cracks in predetermined straight lines. Drying shrinkage cracks are most likely to form at or near sources of restraint such as turn-down footings, depth changes, plumbing, and other penetrations. 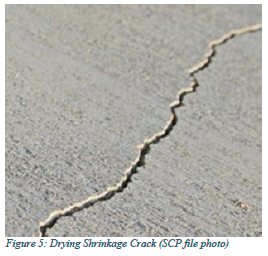 SCP products can reduce drying shrinkage of the concrete significantly by trapping some of the water inside the concrete and filling capillary voids, but drying shrinkage cracks will still occur near these sources of restraint. SCP technology can significantly reduce drying shrinkage, but sources of restraint and improper jointing can still cause cracking. Please note that there are many other types of concrete cracks that may occur. The preceding descriptions are the most commonly encountered early-age cracks in concrete construction. The use of SCP products cannot guarantee crack-free concrete. While proper slab design and installation methods can help reduce the chances for random cracking, ACI states that cracking can still be expected in at least 2% of all concrete panels, even where all work is executed properly. For further information, many sources exist on concrete cracking and the mechanisms involved. SCP recommends information from ACI, PCA, and NRMCA as sources for further reading. Please contact SCP Tech with any questions at SCPTech@SprayLock.com. The choice of aggregates for a concrete mix design is a critical decision that affects fresh and hardened performance. When the need arises to use a special purpose aggregate for reasons such as making concrete that is heavier, lighter, or different in appearance, the considerations for properly blending sizes and shapes still apply. Changes in aggregate type, shape, size, and density can all affect fresh and hardened properties such as workability and strength and must be considered in the mix design process. Spray-Lock Concrete Protection (SCP) products interact with the paste fraction of concrete. Entering through the bleed water channels and other capillary structures, SCP products react with available alkalis to primarily form calcium silicate hydrate (C-S-H) to fill void space. Because SCP products interact with the paste, the type of coarse aggregate used does not affect SCP product performance. There are a few things to consider when evaluating SCP product use with some special purpose aggregates. Lightweight concrete aggregates typically absorb, retain, and release significantly more water than normal weight aggregates. In fact, lightweight aggregates have been shown to contribute to the curing process by slowly releasing water over time as shown by Ben Byard and others. [i] Although a desirable behavior in many types of concrete, this slow release of water over time can be problematic for elevated floors that will be receiving flooring materials. Suprenant and Malisch found that lightweight concrete took nearly four-times as many days to reach a moisture vapor emission rate (MVER) of 3.0 lbs as normal weight concrete in the same environmentally controlled conditions (183 days compared to 46 days). [ii] This behavior has led many contractors and specifiers to the conclusion that lightweight concrete slabs must receive moisture mitigation before flooring materials are applied. 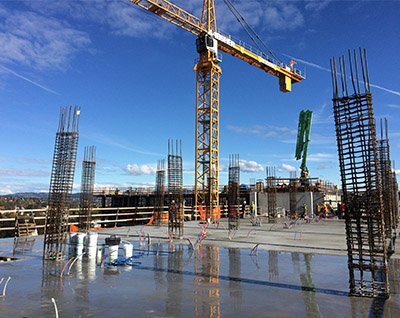 When used at time of placement, SCP products allow application of flooring materials in as little as fourteen (14) days from the date of application to lightweight Portland cement concrete slabs. No moisture mitigation or testing of slab moisture is required, but joints, penetrations, and any cracking must be treated normally with materials and methods specified by the designer. SCP products may be applied to Portland cement concrete containing heavyweight aggregates using standard application methods. Heavyweight concrete treated with SCP products is available to receive adhesives, coatings or paint in as little as fourteen days after product application. The use of recycled concrete as aggregate has seen a growth in popularity in recent years due at least in part to the idea that using recycled materials is an environmentally-friendly initiative. ACI 555 provides specific and detailed guidelines for the removal and reuse of concrete as an aggregate. Even if all concerns outlined in ACI 555 are satisfactorily met, the consensus is that the absorption rate of recycled concrete aggregate is significantly higher than that of normal weight virgin aggregate. [iv] This higher absorption rate may cause issues with MVER performance in similar ways to lightweight aggregate depending on the percentage of recycled aggregate used. As long as the performance of the recycled concrete aggregate meets the requirements outlined in ACI 555 and the concrete is Portland cement-based, SCP product performance can be expected to be similar to when used in conjunction with conventional concrete. Sometimes aggregates are chosen for their inherent aesthetics. They may be exposed to view by grinding, polishing, or the use of surface retarders. SCP products will not interfere with the appearance of architectural aggregates, but because the methods used to expose aggregates in architectural concrete differ, attention to the timing of SCP product application is a key concern. Mock-ups may be required to evaluate the timing of both SCP product application and aggregate exposure methods. SCP products work with almost all concrete that contains Portland cement. Because SCP products react in and become part of the paste fraction of the mix, little interaction between aggregates and SCP products occurs. Architectural applications require attention to the timing of SCP product application and aggregate-exposure operations. [iii] ACI International. ACI 221R-96 Guide for Use of Normal Weight and Heavyweight Aggregates in Concrete. American Concrete Institute Manual of Concrete Practice, Farmington Hills, MI. [iv] ACI International. ACI 555R01 Removal and Reuse of Hardened Concrete. American Concrete Institute Manual of Concrete Practice, Farmington Hills, MI.